Like much other medieval stained glass, this window has been displayed in a number of locations during its history. It may have originally been produced for the Romanesque Cathedral of Troyes, which was destroyed by fire in 1188, but it is also possible that it could have been from another building nearby - the collegiate church of Saint-Etienne. By the nineteenth century the window had been installed in the Lady Chapel of Troyes Cathedral, which had only been built in the thirteenth century. The window is likely to have been removed from the Cathedral during renovations (1849-66) when much of the glass was dispersed. Christ is shown being approached by the Devil, who holds a pile of four stones in his left hand. The panel illustrates the first temptation of Christ, after he had gone into the wilderness to fast after his baptism. The Devil said to him, 'If thou be the Son of God command that these stones be made bread' (Matthew 4: 3). Christ to the right. Satan, on the left, as a green demon with snakes coming out of his head. He offers the stones to Christ. Border of yellow, green and blue foliage pattern. Order that these stones be made bread. A missing inscription with the words 'DIC VT LAPIDES ISTI PANES FIANT' once ran along the top of the panel. 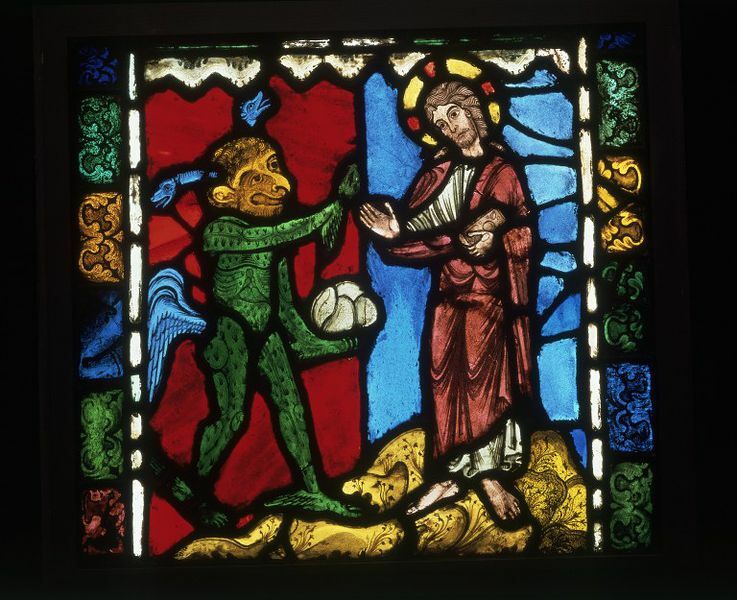 This panel along with Museum number C.108-1919, panels in the Musée Cluny in Paris and Montreal formed part of a Temptation of Christ window. The Montreal panel shows Christ seated upon the Temple with the devil tempting him to throw himself down. The Cluny panel shows Christ ministered to by angels after the third temptation. 2) Temptation series: (Matthew 4:3) If thou be the Son of God command that these stones be made bread. 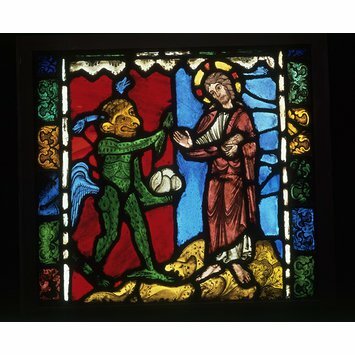 Clear and coloured glass panel with painted details depicting the First Temptation of Christ. France, Troyes, 12th and 13th centuries. Possibly originally in the Collegiate Church of Saint-Etienne, Troyes.